QUIETEUPHORIAN has no current links. If I like you and you like me, isn`t that good enough? Thinking of emigrating from the US to Scandinavia I was born and raised in the US, but have been thinking a lot lately about living in a Scandinavian country. Even though I grew up here, the more I read about the culture in places like Norway, Iceland, Finland, and Sweden, the more I think I might be more compatible with the culture there than what I see here in the US. I like how the culture there emphasizes equality, sustainability, and knowledge, more than capitalism, religion, and fake images like the US culture does. I have some unusual ways of thinking, but I'm not out to impress anyone or say I'm better than anyone, because I'm not. I just care deeply about people, and I guess the US ways are just too conservative for me. I'd like to talk with someone here about what my options are if I might want to live up there. I have a lot of experience with computers and I am fluent in English, but I have very little formal education and no university degree. I'm on a few other sites here, in case you're curious. I have some very liberal views about things that, frankly, most people in this society don't share, and it would be nice to find others who do share them. 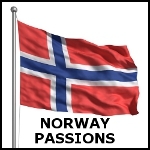 Help us keep Norway Passions free of spam and fake profiles.